as if i hadn't been away enough (between thursday evening's 9 hour jaunt to the delta, friday and saturday's trip to minya with Habitat for Humanity, which I'll write about later, I've barely been home! ), tonight Jason and I are heading out of Cairo to Sallum. Sallum is a town on the Mediterranean coast and the Libyan border. Why would we go there? Well, because tomorrow at noon there will be a total eclipse of the sun there. Very exciting! After that's finished, we'll head to Siwa, the famous oasis with the oracle and whatnot. We'll spend the night, poke around the town (and said oracle) during the day, sleep in the desert Thursday night, and be on our way home on Friday. At least, that's the hope/plan. So I'll be away a few days. I should be back Friday night or Saturday morning. Hopefully we'll have internet when I get home (the weekend is a notorious time for power and internet outages here) and I can tell you all about it ASAP. :-) In the meantime, please: travelling prayers! Thursday afternoon, Sarah and I boarded a train that we prayed was the right one. We didn't know precisely where we were going, we couldn't pronounce the name of the town, we didn't know what stop to get off at, we just barely made out the arabic to know what platform our train was at, and the train was full of Egyptian men commuting home to the delta at the end of the week. Good times! When we realized we didn't know what the station would look like, we called Nassif. Nassif is the pastor of the evangelical church in minya-el-qamh, and he was the one who had invited us down to this village in the Nile Delta to speak at the "meeting" (worship service) for university-age youth. Nassif promised he would 'missed-call' us when the train was pulling into the station so we would know to get off. Well, we came to what we thought was probably the station, but no call. We asked a man at the door and he told us this was "minyelgomeh"--which sounded suspiciously like the Upper Egypt version of where we wanted to go. We made one more quick call and discovered we were in the right place and we jumped off as the train was beginning to move. And that's just the beginning of the excitement! Nassif met us on the platform (after a few minutes of us wondering if we got off in the wrong place!) and walked us through the dirt streets of the village to the church. We turned a corner and saw a huge church building with lots of crosses...but it's the Coptic Orthodox church. We turned into a non-descript doorway that led into a ground-floor flat. It turns out that the evangelical church uses this flat--with a room for a sanctuary, a room for Sunday school, a room for prayer meetings, and a small library--for all its worship, meetings and business because their school and land and church were confiscated under Nasser. You see, the Presbyterian missionaries in Egypt set up schools, and then churches. So churches often used the school building as a worship facility as well. Several decades ago, the Presbyterian church transferred most of the properties to the newly-independent Synod of the Nile of the Coptic Evangelical Church of Egypt (then the Evangelical Presbyterian Church). And then, when abd-el-Nasser came to power, foreigners (especially Christians) were kicked out and a lot of church property was confiscated and church schools were nationalized, becoming government schools. This is what happened in Minya-el-qamh (which, by the way, means something like "land of wheat" and is in the area of Goshen, where the Hebrews stayed while they were in Egypt. There are several traditional biblical sites in the area.). The Evangelical church lost its school and its worship space...and with it, quite a lot of members. The Orthodox church came in and built two large buildings. At one time, all the Christians in the town (about 1/4 of the population) were Evangelical. No longer...primarily because there is no place. One of Nassif's goals is to get money and permission to build a school with a worship space so that some of the families that aren't worshipping or participating will come back to the church. Anyway, Sarah and I learned all this from Nassif in the prayer-meeting room. Then we heard strains of singing coming from around the corner, and that told us that the women's meeting was starting. So...into the little sanctuary we went. 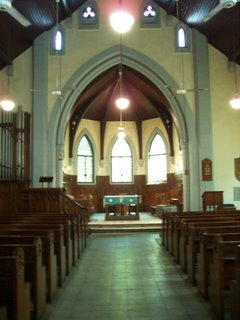 It has movable pews (nice) and the room can hold about 60 people if it's packed to the gills with no room for breathing or fidgeting. Apparently Sunday worship normally has 60 people in attendance. The women's meeting on Thursday night had 11 women and one preteen girl. They read Scripture, prayed a LOT, sang even more, and Nassif preached something about Abigail and Jezebel...in Arabic, so I don't know exactly what he said. After the service, there was snack time: pound cake, date cookies, seven up. yum! Before the "youth" service--the university aged youth, that is--we had a dinner of fuul and tameyya sandwiches as we met the young adults. And then we were off and running again! The service began (at 7.15--a little late because of our dinner) with a lot of singing--maybe 5 or 6 songs, each introduced (and possibly explained?) by one of the young men. There were several prayers offered, more singing, a psalm read one verse at a time around the room, more singing, more praying, and then....da da da daaaaa!! Me. I spoke to the group of about 17 people aged 17-25-ish (plus one mom) about how Abram and Sarai had their names changed to Abraham and Sarah as signs of their relationship with God, and how Peter became Satan temporarily but was still in relationship with God, and that the wonderful thing about God's covenant with us is that God promises always to be in that relationship--even when we make mistakes we still have the privilege of talking to and listening to God. Then Sarah talked about prayer--when, where, how, what, and why we pray, and about how prayer can help us maintain that relationship we have with God. She talked a lot about listening, too....because who likes to have a friend who only talks about themselves? If Jesus is our friend and Lord, we have to listen as well as speak. She also talked about being bold in our prayer, because we have nothing to hide and nothing to fear--only a God who loves us and wants to be in relationship with us. It was a good talk. It's interesting to speak to an Egyptian church because, of course, we had to be translated. Nassif stood with us and translated each sentence. Which means I had to stop after every sentence and let him translate. Which is something that really messes with your momentum, let me tell you! It was strange...especially since I didn't have any written notes (I'd preached the sermon twice and was really just excerpting and adapting from that) so I felt like I was repeating myself because I kept losing my train of thought while he was talking. But Sarah said I wasn't repetitive, so that's good. After we spoke, we prayed and then there was more singing. Then a benediction from Nassif, and then more snack time--and it was 9pm! We'd been in there for nearly 2 hours. We spent some time talking with some of the young people, especially with a 17 year old young woman named Demmiana. She goes to the Secretarial College here at RCG--the one just downstairs. (that's right--she's one of the girls we push past and who swarm us constantly whenever we leave the building during school hours.) She takes the train up to Cairo every morning and home every evening, about an hour each way. She's a real sweetheart. She's actually Coptic Orthodox, but participates at the Evangelical church because those are her friends. also apparently the orthodox church is heavy into the guilt-and-shame thing and her self-esteem needs a boost, which she finds from her evangelical friends and pastor. She is probably one of the nicest people I've met in Egypt. Nassif says that his church is trying to show her the truth, and to build up her self-esteem and sense of herself as a good woman and a good believer. hmm. From my experience in this village, I have a couple of interesting thoughts. First about music: often we hear that missionaries did a lot of harm in the 18th and 19th centuries by bringing Western culture and Western forms of church and imposing them on people in other lands. I know that to be true in many places. One of the signs of this is often found in the music: Western hymns translated (or sometimes with locally written words) being sung in indigenous churches. I am here to tell you that this is not a problem in the Egyptian church...no no no. In fact, I recognized not a single tune out of the probably 15 songs I heard on Thursday evening. The music sounded decidedly Middle Eastern and fit the Arabic language well. It had that slide-y sound and modal flavor that is only found in the Middle East. I don't know enough Arabic to tell you what any of the songs were about, but people sang them with great fervor. Third about the village church: wow. This was a vibrant church. Small, yes, but vibrant. On Friday they had a family day, with worship and a church picnic. They have worship on Sunday morning and evening, they have women's, high school, and university meetings (worship) on Thursdays. They normally have activities on Fridays. They have prayer groups. There are about 100 families that are members, according to Nassif, and 60 people come to each worship on Sunday, plus the mid-week services. For a church with basically no property, no home, this is amazing. They have experienced so much adversity, they are still persecuted in a subtle way (churches can't buy property or build anything without a permit, which is hard to get and takes a long time and often isn't granted; the orthodox church has come in and displayed its wealth and influence by building two large buildings, etc. ), and yet they are thriving. In a town of 100,000, with only 20,000 Christians, they are a minority of a minority, but they love the Lord and it shows. It was a great night. Sarah and I headed back to take a train at 10.15pm, which brought us back to Cairo at 11.25. oy! We had to turn around and be back at the station by 7 the next morning, so we were quick to get to bed when we got home. all in all, a wonderful experience. I hope I can go back to that church sometime. I posted photos of this church on my yahoo photos page...check it out! It's not my birthday right now. It's my birthday on October 21st. I know that sounds like a long time from now, but it's not when you are talking about New England bed-and-breakfast reservations! That's right...for my birthday, my dad has made me reservations at Snowvillage Inn, for the White Mountain Cooking School. (You may have seen them on the Food Network; they're famous for chocolate-cooking weekends.) The weekend of my birthday (OCt. 20-22) they are having a Vegetarian Cooking Weekend!!! How perfect is that? It's providence, I tell you, providence. The place looks beautiful, I'm excited to learn more about cooking, and Jason is going to come too (but not cook because he's not into that). woohoo! Thanks dad. In other news (still about presents! ): It was Mother's Day in Egypt yesterday. The girls at RCG give presents to their teachers on Mother's Day, because we are like mothers to them or something? Anyway, most of the teachers had bags and bags of loot. I have received 6 presents so far this week: two bottles of perfume (one nice, one kind of old-lady), one can of cologne spray, a mug that has hearts on it and says things like "dear mother, we love you!" and "you're a great mom" and stuff like that, one 3-D picture in a frame (looks like it's from Target! I miss Target. ), and a really beautiful candle-holder--silver metal butterflies dancing around a blue glass cup with a white candle inside. I've also received one styrofoam heart colored red, one heart-on-a-stick, and one red carnation. And, of course, lots and lots of "happy Mother's Day Mrs. Teri" and lots of kisses on the cheeks and lots of hugs. Nice. I even had one girl tell me to wish my mother a happy mother's day. So mom, there you have it: Happy Egyptian Mother's Day. I hope you're enjoying it. I love you. it's probably a sign of a not-so-good-day ahead when thinking about putting sugar in your raspberry tea makes you cry about your mom because of the time you were in Savannah with her at the Tea Room and she mentioned that the Red Fruits tea was better with sugar because it brought the fruit flavor out more. and then it makes you think about how selfish you were because in August when you left for Egypt you took your tea ball and loose-leaf tea (including said Red Fruits) even though your mom really liked them, and when she called you later she was really excited asking where you'd put the tea ball and you had to say "in my suitcase". Just saying...it's a long day ahead. I think there might be Dr. Pepper later too. For today's Friday Five, tell us about five ways you have spent a spring vacation or holiday, pleasantly or un-. And as a bonus question, describe your dream spring vacation. 1. A band trip to Hawaii my senior year of high school. We played like two concerts and a clinic, and spent the rest of our days on the beach, shopping, and at the cultural center. our hotel (in waikiki) was across the street from the Honolulu Zoo and about a 1.5 minute walk from Waikiki beaches. I got pretty sunburned on our last day, right down the middle of my head because I was wearing my hair in two french braid pigtails. I could barely lean my head back on the plane seat. 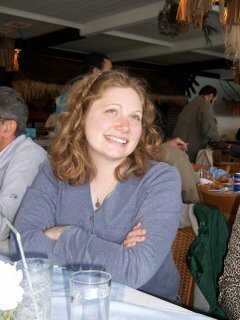 2. a last-minute Carnival Cruise with Katie on spring break of my first year at Columbia. It was excellent. Key West, Cozumel, days at sea, lovely food, lovely weather (mostly), lovely swimming, etc....only downside: we were the only young adults on the boat aside from four college-senior-boys from upstate NY whose sole purpose in coming on a cruise was to be as drunk as possible the whole time. Of course they were our assigned table mates. grr. all the other people on the cruise were old people or families with young children. 3. last year i spent spring break with my parents. It's the first time I've done that since my freshman year of college, and it was totally worth it. I wanted to spend as much time with my mom as possible, and I'm glad I did. It was a wonderful week and I was sad to leave (even though I hate Yakima). Mom and I watched the Food Network, read, took naps, sang along to music, went on outings (to the grocery store mostly), went to doctors appointments, gossipped about the family and the people in town, and cooked--well, I cooked while mom gave directions, mostly--for a week. it was great. 4. Since we don't have spring break in Egypt, I'll say something about the mid-year break (in January) when I took two fab trips: a cruise on the Nile and a trip to Italy. You've read all about those before, I know. (except not ALL about Italy because I got tired of writing after four of the seven days.) One of the highlights of Italy was climbing St. Peter's Dome and then climbing Brunelleschi's dome (The Duomo) in Florence. Having read books about Brunelleschi and Michelangelo and company, it was really really cool to go there and climb up and see how it all works. Awesome. 5. I can't remember a single spring break from college. I probably spent most of them in practice rooms, frantically preparing for spring recitals. Except my senior year, when I most likely spent it at church because I think spring break coincided with Holy Week. I wasn't exactly the wild-and-crazy college girl. bonus: dream vacation? Safari in Africa. I can't wait to convince Jason that we should save up for a safari starting and ending at Victoria Falls and visiting Botswana in between. How cool is that? i've been reading a lot...too fast to even update my little side-bar-space for books. That's what happens with me, often...I like books. Anyway, for some reason I seem to have come upon quite a few books lately full of relationships where one person is so insensitive and selfish and ambitious or whatever that they are literally incapable of feeling anything for the other person. The Secret Life of Bees. The Mermaid Chair. Even Babette's Feast went like that a bit. And the latest: The Sunday Wife. This one particularly hit because it's about a pastor and his wife. An ambitious pastor and his wife who he insists on "changing" and "bringing up" and who does everything he asks even when it's completely unreasonable. It's also about lots of other opressive and abusive relationships, both personal and corporate. But when the wife makes a friend and begins to think for herself, her whole life changes--for the better, for her. I was so irritated with how the husband/"pastor" behaved throughout the book that I wanted to scream and be violent against an obnoxious man somewhere--look out, nasty Egyptian men!--but of course i couldn't because today is one of the days I normally don't leave RCG (and there's something about not leaving the walls that's really nice sometimes). Anyway....the pastor was so ambitious and so selfish that I doubt he could even care for a parishioner, let alone his wife. (something to watch out for if one is a pastor, I suppose.) I definitely questioned whether he was called to the ministry or if he did it because it was a noble profession in which he could advance and be adored and have a lot of power. There's another pastor in the book who "fell in love" with a 14 year old girl who was his babysitter, and then decades later they meet again and she plans to leave her husband and ends up getting herself killed. At which point the current pastor is completely heartless and can't understand that his wife is grieving for her friend (of whom he disapproved anyway). He even makes her go to counseling alone--though the majority of the problem stems from his indifference to her feelings and thoughts and personhood--refusing to go because "there's nothing wrong with me" and because it would hurt his advancement in the church!! OY. While each of these books ends up relatively well--with realizations or with love or with freedom (or all of these! ), and in particular the Mermaid Chair ends pretty realistically, not mindlessly idealistcally (and it's a really wonderful book, really), I was so frustrated after this spate of books that I was just wishing for a book with a story of a healthy relationship, a healthy marriage, people who actually care for others and who have good friends, etc. So I decided to read The Blue Castle this afternoon. it's not long and it moves quickly. It was recommended to me by a good friend and discerning reader, so I read it (as an e-book). At first I thought I was reading another oppress-the-woman book, because it begins with a 29 year old unmarried woman being really really oppressed by her puritanical family. but it definitely looked up and ultimately became a really wonderful love story, complete with a happy healthy relationship! The man she marries (after asking him!) says things like "well, I couldn't say for you because I didn't know what you thought." He treats her well, they talk and they don't, they walk and they have fun and they act serious and all the while he treats her like an equal. At last! I was so happy. (but, whatever the amazon reviews say, there is at least one aspect of the "ending" that becomes obvious several chapters before it's revealed. But the big thing--definitely not!) I got what I needed from this book, ilhamdulillah!! And that's what I've done the past two days--I've read two books (for a total of probably more than 500 pages, I guess) during the time I haven't been teaching. I love Thursdays. Well, preaching at St. Andrew's United Church of Cairo is a very interesting experience. On Friday, it's a congregation of about 35 or 40, a little more than half Western expats, the rest a mix of Egyptian, Sudanese, and a Pakistani family of 5. We use the main nave of the church and the lectern but not the raised pulpit cage thing. On Sunday, it's a congregation of about 10 or maybe 15 when the YAVs come, almost all Nigerian and Sudanese and the occasional other African, with one western expat, one or two egyptians and one 93-year-old American ethnomusicologist/organist who was born in Egypt to missionary parents and spent most of her life in Egypt, including being the organist at St. Andrew's for about 50 years. Unfortunately, she still thinks she can do that even though she can't anymore because she can't see and her hands don't work as well anymore. (anyway, she "played" the organ today.) We sit up on the chancel in the choir stalls and use a shorter lectern placed there just for Sunday. As you can see, this is quite a contrast, and a challenge when one is planning to preach the same sermon, using the same texts and the same liturgy, on both days. But there's something about that church....it's just not exciting. I hesitate a little to say this, but i just don't get the sense of it being a spirit-filled church. Maybe that's because the pastors don't convey a sense of enthusiasm about worship (in fact, they have both said to me--independently and at different times--that they "don't know anything about worship" and don't find it particularly stimulating to lead worship on a weekly basis) and people pick up on that. The congregation doesn't really sing, they practically whisper the responses and prayers, and they have that blank stare that I really hate seeing. Not even head nodding, no laughing at my minor funnies, nothing. At least on Sunday with the Africans I got some head nods and affirmative blinks. On Friday, nothing. And the thing is, the Sudanese Refugee ministry is thriving, the two Sudanese congregations are thriving, but the expat congregation is dwindling and, frankly, a little cold in the pews. So anyway, it was a great preaching experience, lots of people said I did a good job, a few people uttered the dreaded "that was a lovely message", and one person confronted me for not preaching a literal interpretation (non-interpretation?) of the gospel lesson. But having said all those things, I doubt I'll worship much in that church anymore. I haven't been worshipping there (except when it's been required for our YAV group) for several months now anyway, and except for when another YAV preaches, I probably won't again. I have found another English-speaking church, down in Maadi (far to go, but worth it) that is interesting, intellectual, emotional, spiritual, full of robust singing, has communion every week, seems to have good community, and is, I feel, a better candidate for feeding me spiritually than St. Andrews has been. I'll let you know how it goes. From songbird. This is my kind of Friday Five! I love to talk about hair. Especially mine. And also especially how other people should let their hair out of the People-Magazine box. I have. In high school we went to Hawaii and I used Sun-In which turned me a little blonde. In college I spent two summers living and working in Scotland and I colored my hair copper once and auburn once. Auburn was bad--it turned out much too dark and with purple undertones. When I got home to Chicago I had to go to a salon for a color correction, which took several hours of sulfur-smelling stuff and recoloring back to a coppery blonde. ugh. I have also had highlights several times. I can handle that. But it's not good for your hair, and I'm all about doing things that are good for my hair. 3) What's the longest you've ever worn your hair? The shortest? *Well, there's the classic Oh Where Is My Hairbrush from Veggie Tales..."why do you need a hairbrush you don't have any hair!!" *There's also the scene in the first chapter of the Princess Bride where Buttercup suddenly realizes that she could be really pretty and she brushes her hair a thousad strokes a day, and it takes a long time, but it doesn't matter because won't Westley just love her autumn-colored hair when its so shiny and wonderful? “What’s your name?” “What’s your name?” What’s your name!?!?! ?” This is the most common English phrase on the streets of Cairo. It’s usually the first question people ask when meeting someone new—right before “what do you do?” It’s a question I ask over and over of the 240 schoolgirls I teach. Calling someone by name rather than by “hey, you!” can make the person feel valued, cared for, interesting. Getting a person’s name right can really mean a lot. Sometimes, maybe it means too much—like when your mother calls you by your first, middle, and last names and then you KNOW you’re in trouble for something! Maybe that’s one time when we would prefer not to hear our names spoken so clearly. Choosing a name for a child is often a long process involving poring over lists and books of meanings, spending lots of time negotiating favorite and least favorite names with family and sometimes friends, and trying to discern whether the child will “be more like” a Sarah, a Betty, or a Rachel? A Tom, a Richard, or a Max? Names tell something about us, somehow—they fit a person, or maybe they don’t and a nickname is used instead because it seems more fitting. I doubt many parents would be excited to find out that their children had gone and changed their name, or that someone else had changed the name of their child, after all the work that went into choosing the right name. But that is exactly what happens to Abram and Sarai. They have perfectly good names already, probably chosen by their father. But one day God comes and says, “I have new names for you—you will be called Abraham and Sarah now.” And with just one H, Abraham changes from “exalted ancestor” to “ancestor of a multitude” and Sarah changes from nothingness into a Princess, mother of kings and nations. Just one little H each, to symbolize the incredible covenant God had decided to make with them. This is not the first time we’ve heard about God’s covenant-making ways, and it isn’t the last time we’ll hear about it either. Last week we heard the story of Noah and how God covenanted not to destroy the earth with water again. The symbol for that covenant was (and is) the rainbow. Next week we’ll hear the story of the Ten Commandments, with tablets of stone as the symbol. On Maundy Thursday, and every time we have communion, we hear about the new Covenant, with bread and wine as the symbols. On Good Friday and Easter, we see and hear about God’s covenant of sacrificial love, symbolized by the cross. Whenever a child or a new member comes into the church, we hear about God’s covenant to be our parent, symbolized by water. Symbols and covenant are nothing new to us—in fact, we probably consider ourselves something of an old hat at all this covenant business. We’ve got it down, backwards and forwards, like the back of our hands. Well, this covenant with Abraham and Sarah, it has a different kind of symbol. It’s not something physical, tangible, that you can see and touch and taste. It’s more like a complete change of being. God changes their names, the way they are identified, the thing that has been constant and has gotten them through a hundred years of life. This is not just any old covenant, not just any old God, but a God who changes the very thing that defines who they are. I think of the old tradition of bestowing a baptismal name on a child, or of people taking a new name upon entering a monastery, or of a couple getting married and changing last names to reflect the covenant between them. All those traditions of name changing require growing-into. It takes time to grow into a new name, whether it was acquired at baptism, at holy orders, or at marriage. Abraham and Sarah are no different—their new names declare that they are ancestors of multitudes, of kings and nations. But they aren’t, not yet. Even though God says “I have made you the ancestor of a multitude of nations”—God uses the past tense—it’s still true that Abraham has only one son, and not by Sarah. For all Abraham’s faithfulness that is reckoned to him as righteousness, he still didn’t believe he and Sarah would have a child—he laughed at the prospect! His name has been changed, he’s been told what will happen, but he still hasn’t grown into it. So he laughs, and then begs God for Ishmael to be good enough, for Abram and Sarai’s solution to the problem of barrenness to be adopted by God—but God is having none of that. And yet Paul tells us that Abraham believed God, even when there is evidence right here of disbelief! Abraham disbelieved, Abraham laughed so hard he fell down, and still the covenant and the nice new name are his. I doubt this is what Peter was expecting to hear from his Lord, the Messiah. I mean, Abraham disbelieved but he still got to be called the “ancestor of multitudes” and he still got to have another son, this time by his lovely, disbelieving, liar of a wife with her new name “princess.” And Peter falters for one second and suddenly he’s the bad guy, the one no one wants to run into, the adversary who tries to thwart God at every turn. It doesn’t seem fair. Not only that, but Jesus makes a whole speech about denying yourself, taking up the cross, and following him; about losing your life for him; about not being ashamed of him. Peter must have felt like the attack continued even after the name-calling had finished. Jesus says not to worry about what others think, Jesus says not to worry about your life, Jesus says not to think so much about yourself, Jesus says that if you are ashamed to listen to him in public then he will be ashamed of you…these are harsh words. And Peter knew they were directed at him, probably more than at anyone else. Yes, it is a lesson for all the disciples, for the crowds, but especially for Peter. And, of course, for us. Often this passage is read and preachers stand up front and say “give every part of yourself” and “don’t be selfish” and “if you want to be a Christian, you must serve until you drop.” I don’t think that is what this is saying. We have seen Jesus spend time alone, we have seen him take the day off, we have seen him go on vacation, we have seen him spend time eating and drinking and resting and praying. I don’t think this passage is about eliminating Sabbath, it’s not about caring so much for others that you neglect to care for yourself. Instead I think this business about denying yourself, taking up the cross, and following Jesus, this talk of losing your life in order to save it, has something to do with Abraham and Sarah and the new names God gave them…and with the name God gives each of us. Abram and Sarai were told to leave behind their old names, the names they had lived with for a hundred years, the names that defined who they were, that were the identifiers of a life well and long lived. When they became Abraham and Sarah, those two little h’s started them on a journey—a journey of leaving the old self behind and becoming the new creation God had in mind for his covenant partners, walking before the Lord. Abram and Sarai were no more—that life had ended and a new life was begun, with new names to symbolize the covenant and the journey. Abraham and Sarah had a long way to go to grow into the names God had given them—in the beginning they both laughed outright at the thought that they could indeed be the people God said they would be…that they could be ancestors of multitudes of nations, of kings and princes. In the same manner, Simon became Peter, the rock. And in the midst of his growing into his name, he briefly became Satan—a name which could have stuck, but luckily didn’t. Peter outgrew the nickname. It was only a brief stop of disbelief on his journey of following Jesus. Six days after Jesus called him Satan, Peter was invited up the mountain to witness the transfiguration. And a few months later, Peter was preaching the first sermon of the Christian church. And a few years after that, Peter became the first Bishop of Rome, ancestor of the Pope. But it was a long journey, growing into a new name, growing into the sign of the covenant. And through the whole journey with all its ups and downs, complete with disbelief, public ridicule, and doubt, God is still faithful to the covenant. In the same way we are all on a journey, a journey particularly highlighted during the season of Lent. This is the season when we spend time reflecting on the ministry of Jesus, his journey to the cross, to hell, and back again to life. This is the season when we examine ourselves, when we employ spiritual practices such as fasting and prayer, and when we repent: we turn again to the path God has set us on. This is the season when we look at the symbols of the covenant—rainbow, tablets, water, bread, wine, and especially the cross. It is a season when we reflect on the name God has given to us. Scripture says that anyone who is in Christ—anyone who takes on this name of Christian—is a new creation: the old has gone and the new has come. Just as Abram and Sarai are no more, so our old selves are no more. They are lost for the sake of the gospel, washed away in the waters of baptism so our new selves can be fed at the table. And then we can walk before the Lord, we can follow Jesus wherever he leads—though the journey is long and may seem impossible, we don’t need to be content with only the human solutions. Instead we can set our minds on divine things and bring them into our earthly life. The covenant between God and Abraham, the covenant extended to all humanity and realized in Jesus the Christ, isn’t only about the outward, tangible symbols. And it isn’t only about doing the right thing or saying the right words. This is a covenant that changes your life. This covenant defines who you are. You are a child of God. God knew your name before you were born, God calls you by name even now, and God was willing to even give you God’s own name to grow into. And so we journey together, learning what it means to leave our old selves behind and to grow into the new creation God has named us to be. i just discovered what happens if you visit Jesus.com. And all I have to say is: AWESOME. And I wish we'd thought of this. well, through some miracle of the Holy Spirit, I have a sermon. And church day (Friday) is still a whole 35 hours away. This will be the first time I have ever had a WHOLE DAY to sit on a sermon and make changes that will, in theory, make it better. wow. Do you wear a cross? Do you wear a cross? : a meme from st. casserole. Do you wear a cross? 99.999% of the time. Is there a particular time or place that you consider wearing a cross? all the time. i sleep, eat, shower, do everything with it on. Where do you wear it? I wear a cross on a necklace, outside my clothes if it's a long chain, or just at my throat if it's a short chain. What does the cross look like? I have several crosses. The one I am wearing right now is a silver Jerusalem cross, about 1/2 inch square. Who gave the cross to you or did you choose it? I bought it in Jerusalem on the METS trip in 2004. Is this your favorite cross, if so, why? umm, yes? I have two crosses that are my favorite, for different reasons. (out of three crosses, this is a significant percentage that suggests I am bad at win-lose situations.) I like this cross because it reminds me of Jerusalem, because I feel connected to the cloud of witnesses and to the Christians I know in the Middle East, and because it's very similar (ie identical) to the Orthodox cross used by Christians in Egypt. I also have a cross from Tiffany that I coveted for a long long time before my pastor gave it to me upon my graduation from seminary. I love that cross too. Wanna play? Tag yourself and tell us if, when and why you wear or don't wear a cross. I am beginning to seriously think and pray about what to do after my term of service in Egypt is finished. I have begun to work on my PIF (even though I won't be allowed to circulate it until August, I figured that a few months to sit on it before making final revisions felt like a good way to pare down the language to say what I actually want it to say). I have written my CSC for the Columbia Seminary website. All I need now is something to point the way I should go....and so I am asking any of you who read my blog to help me out. send me happy thoughts, pray for me, and if you have any ideas or sudden inspiration RE what I should be doing when I leave here, let me know. 1. no caffeine, no ice cream. Yes, I did this the same year. It was a bad idea. I was completely miserable, AND a new starbucks had just been built near the music school. I referred to Starbucks as "my personal wilderness" multiple times every day for the entire 47 days. Easter morning I grabbed Starbucks on my way to the sunrise service. and again afterward. And at brunch post-11:00, I had ice cream for dessert. And I proceeded to gorge myself for about a week afterward. 2. no bad-mouthing the clarinet. I gave up constantly over-emphasizing my hatred of the clarinet and the life of a musician. At least, I gave up verbalizing it. It really did help--I think I became a more positive person in the long run. I also got out of the professional music scene because I wasn't willing to constantly bad-mouth other people, either. I was pretty vigilant about this, and I had some friends who were tired of my constant "i hate my life, and it's all the fault of the clarinet" spiel who were great accountability partners. 4. I tried "fasting like John the Baptist" one year...just on Fridays. Our Ash Wedensday sermon included an outline of different types of fasting, and apparently you can fast like JTB by only eating bread, nuts, honey, berries, and something else I've forgotten. (not locusts...and did you know that the locust tree produces carob as its fruit?) Anyway, I lasted two Fridays before Friday snuck up on me and by the time I remembered it was Friday I'd broken the fast. And then after that I forgot every week and suddenly it was Easter. It wasn't my most productive Lenten discipline, to say the least. bonus: 5. I began singing through all the psalms in the Presbyterian Hymnal during Lent one year...one at a time. I'm a pretty good sight-singer, and I can often learn a tune using solfegge first (thanks, Dr. Atovsky--you were crazy, but I learned a lot from you). I kept going until I'd sung all the psalms in the hymnal twice. Now I'm using Michael Morgan's Psalter for Christian Worship, which is a nice change. And the "one thing I might like to try that requires practice, attention or commitment": hmm...well, this year Jason and I have decided to work together on a Lenten discipline. We will sit down together every night and talk about things from our day that impacted us, and we will ask each other for prayer, and we will pray for each other, together, right there. So far, two nights in, we're good. Hopefully this can grow into a habit we continue. It will require lots of commitment because we are usually busy in the evening and often go until we're so exhausted we can't do much besides brush our teeth (well, i do anyway), and it will require practice in asking for prayer for anything and everything. that is not a good ending for a post, but i can't think of anything else to say AND it's way past my bedtime, so...goodnight. 1. protestants here don't DO liturgical seasons or anything like that--it's too orthodox. and the orthodox don't have ash wednesday because they started the Great Lent Fast on Monday--55 days before Easter. 2. The service at the Catholic church in Coptic Cairo was too close to the time of my English Class at the Coptic Cathedral. my church sends out daily devotions, and the devotion for Ash Wednesday was particularly good, I thought. check it out. i miss the ashes. but i guess there's next year....insha'allah.